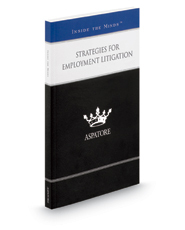 This Aspatore legal title provides an authoritative insider's perspective on successfully handling employment-based lawsuits. Partners and chairs from some of the nation's leading law firms examine the current legal climate, the latest legislation, and the recent caselaw that attorneys and their clients are likely to encounter. These top lawyers discuss strategies for developing a case, investigating allegations, and working with judges, juries, and other attorneys. Additionally, these leaders review the advantages and disadvantages of alternative dispute resolution and how to make the best decision for the client.